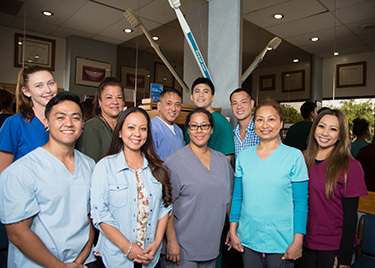 Founded by Dr. Scott Gomez more than 30 years ago, Premier Dental Group HI in Pearl City feels like a tight-knit, family-run place. Many of our staff have been with us for decades, and we enjoy catching up with our patients who have been part of our practice family for years. We provide a broad spectrum of dental services that will suit the needs of every member of your family. No matter what your dental goals may be, our experienced team will help you achieve them. We offer same-day dentistry and Saturday appointments in addition to 24-hour emergency care. Care Credit is accepted, and insurance can be used for your visits. We participate with HMSA, HDS, Aetna, Cigna, MetLife, HMAA, United Concordia Tricare and Delta Dental. We speak Ilocano, Tagalog and Vietnamese. We are also open one to two Saturdays a month from 8 am to 2 pm. You’ll find that our approachable team is easy to speak with and can help you look forward to your dental visits. We provide superior dental care that solves your problems and keeps your teeth and gums healthy in the long run. Find out more about our dentists below! Dr. Kris Nip With many family members in the medical field, dentistry was a natural fit for Dr. Nip. He worked as a dental assistant to a pediatric dentist during college and saw how using just his hands, the dentist took care of his patients, getting them out of pain and using artistry to create smiles. Dr. Hennasea Tokumura: After volunteering with a small community health center in Waimanalo, Dr. Tokumura realized that she found immense reward in helping others less fortunate achieve a healthier outlook on self-care and appreciated genuine connection with members in the community. Hygienists Chantal and Hazel Our warm and friendly dental hygienists are passionate about helping patients achieve and maintain optimal oral health at Premier Dental Group HI. Contact us today to get started on brightening your smile! Office is clean and has a great location with ample parking. Staff are always friendly and helpful. Dentist and hygienist are skilled and gentle. I have not had a bad experience. Kendal Y.
Dr. Scott Gomez is the best dentist I’ve ever had. He is very compassionate to my dental needs. He is knowledgeable in his field. He has a super nice and efficient staff. I would highly recommend Dr. Gomez. Rosal R.